Are you a pregnant or postpartum woman who experiences pain in the front or back of the hip, lower back, buttocks, or down the leg? Does the pain create difficulty standing on one leg, getting in and out of cars, or climbing stairs? If so, then you might be experiencing pelvic girdle pain (PGP), also known as symphysis pubic dysfunction. Today you’ll learn what it is, what causes it, and what you can do about it. If you don’t have the symptoms yet, you’ll also learn what you can do to minimize the risk of developing PGP. 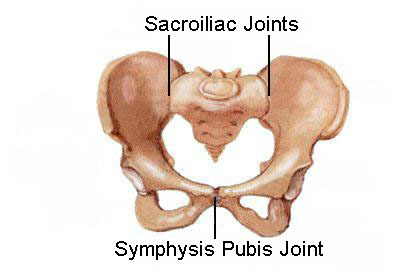 The pelvis has three primary joints: two sacroiliac joints and the symphysis pubic joint. The former join the pelvis in the back while the latter joins the pelvis in the front. These joints have very little movement – usually. But during pregnancy, women experience a rise in the hormone, relaxin, which relaxes tissues and joints in the body. This is important to prepare the body for labor, but it has the unfortunate side effect of increasing joint instability. If movement in the hip joints increase, it can create the symptoms described above, causing PGP. The pain can be debilitating and is common in pregnancy. Women can decrease their risk of developing PGP by strengthening their core muscles, which support the pelvic joints. Pelvic tilts are a great way to strengthen the transversus abdominis (TVA), the deep abdominal muscles that lie beneath the rectus abdominis, or the “six pack.” Performing kegels will strengthen the pelvic floor, and performing opposite arm-opposite leg reaches from the quadruped (all fours) position will strengthen both the lower back and the TVA. The glutes are also a part of the core, although we don’t typically think of them this way. Exercises that effectively target these muscles include single leg squats, glute bridges, and donkey kicks. Other exercises place pregnant and postpartum women at a greater risk for developing PGP. Women should avoid quick or jerky movements that may cause the bones to separate. Lateral and rotational lunges when executed powerfully can also be problematic, as are exercises that abduct the legs simultaneously (e.g. those that bring the legs apart, such as the the hip abduction machine). If you do suffer from PGP, you’re not alone. And now you have some tools to help you find relief! Next postWhy You Should Deadlift – Even if You’re Pregnant! I wish I could Pin your blog posts for future reference, you have great material!